The result of long lasting and consequent development and has been extended, improved and provided with numerous new functions and features compared to the previous version. Special attention was paid to the Unified-Messaging components as well as the appointment planning, calendar functions and the management of addresses. Here you can find the most important highlights of David. David uses preexisting system resources much better than before. Integrated portals and address dialogs are opened up to 43% faster and thus it is much more efficiently integrated into the work environment. The user rights can now be modified faster and straighter to the companies' specifications. You are now able to prevent single users from using Feeds or the remote access, for example. Thanks to the simplified and transparent license model, optional services and modules are now completely integrated into the David start package. For instance, you can now connect an unlimited amount of cameras to your David Server or use the DVCC module for individual scripts. 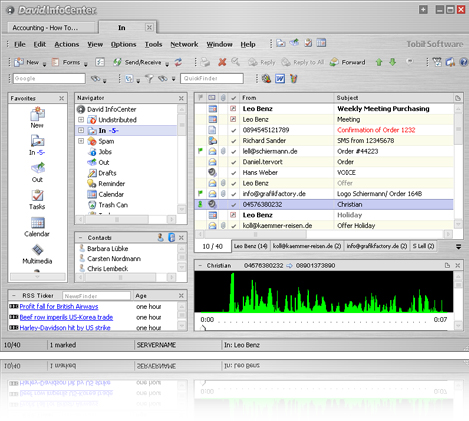 Additionally, all optional mobile components of David like the David.InfoCenter Pocket, Web Access or InfoCenter Mobile have been consolidated to one single add-on license. If you forward a received VoiceMail as an eMail to one of your colleagues, the phone number of the sender will be added to its subject automatically. So the recipient of your eMail knows directly who he is dealing with. With David you are able to fax your documents directly from your connected scanner via the David InfoCenter. David scans your documents fully automatically and converts them with one mouse click to the TIFF-fax format. Now you can comfortably fax your documents to the respective recipient. David is equipped with a completely improved fax preview. Here you are able to rotate, zoom in or out your faxes to get the best view. Even the preview of individual notes is now possible. In addition to this, you can now decide if your notes like stamps or text fields will be saved or not. 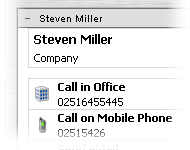 Thanks to David you are now able to receive SMS messages directly over the ISDN network. Completely without any additional GSM-hardware like mobile phones and cost-intensive provider contracts. Now the integration of the medium SMS into your work environment is mere child's play. All address dialogs and context menus of David have been improved and re-engeneered. With one mouse click you are now able to send an appointment request to one of your contacts or get connected to him by phone. The new designed interface clearly focuses on fundamental information and improves the usability of the David address book. David includes a fundamentically overworked David.InfoCenter which allows you to handle your daily work more comfortable. Thanks to the discreet and appealing "Stainless Steel" design and the optimized adjustment of buttons and menus the really important information is centered. And that is what really counts! 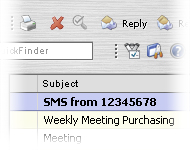 It is not always easy to keep track of messages in your inbox, especially when you receive a lot of them every day. David takes care of your inbox and sorts all senders using so-called "tabs". 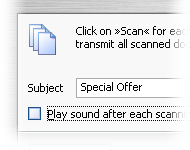 With one mouse click you can now find a particular message within seconds without any additional complicated filters. The David InfoCenter Web is now more equal to the David.InfoCenter PC than ever. 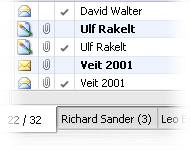 Thanks to David you create and edit tasks, open single messages with one mouse-click or use the practical preview to access weblinks directly in the David.InfoCenter Web. 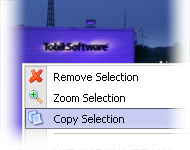 You are now able to create the message type "Document" to save important information directly into the Tobit Archive Structure, even if you are out of office. In addition to this, HTML formatted address information will now be displayed in the David.InfoCenter Pocket which increases the comfort of your address management. The integrated Picture Viewer of David is more powerful than ever. You are now able to cut out a part of a picture, copy it or zoom in to have a detailed glance at it. David comes along with the integration of a useful Dashboard, which is your graphical project interface for any kind of automation project. Via Drag & Drop you can easily create your individual automation plant layout, a status visualisation of all switching operations or an interface to observe all automation processes. With David 12 you can setup your own Feeds Server in no time at all. Thanks to this otion you can provide your customers and business partners with your own Feeds. This offers new possibilites to increase your sales and spread news within your clientele in the individual design of the David.InfoCenter. 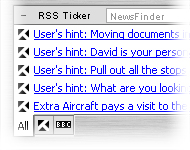 It does not even matter which RSS Reader your customers are using. If you receive a lot of Feeds from different providers, David will create single tabs for each of them. This way you can easily switch between different Feeds.